Our field crew, from left to right: Mark Agimuk, Kristine Sowl, Jessica Stocking, Brian Robinson, and me (Alan Kneidel). 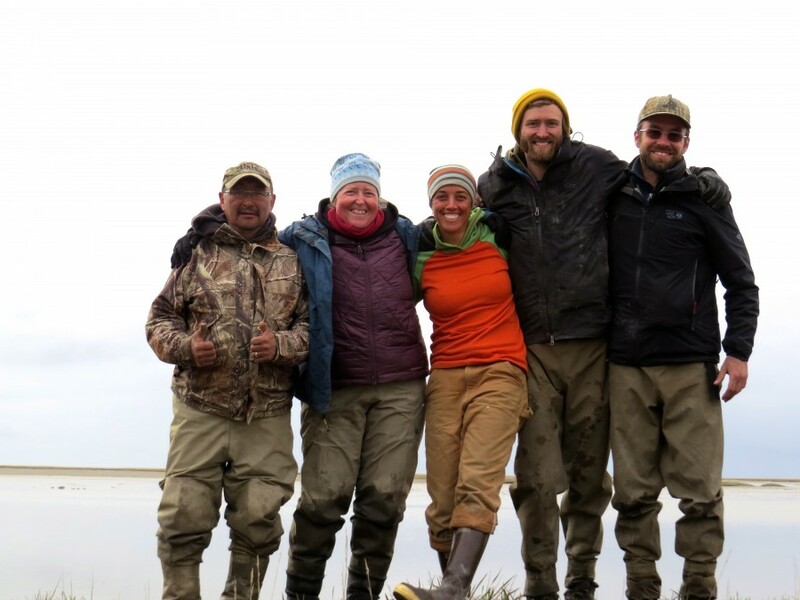 From May 25th to June 9th I joined a team of shorebird researchers to perform PRISM rapid shorebird surveys in the Yukon Delta NWR of western Alaska. The area of the refuge that our team covered was between the Askinuk Mountains and Nelson Island, an area that falls within a helicopter exclusion zone. Therefore we operated by boat and our start date was partially dependent on the break-up of ice on the rivers, after the helicopter surveys were completed. 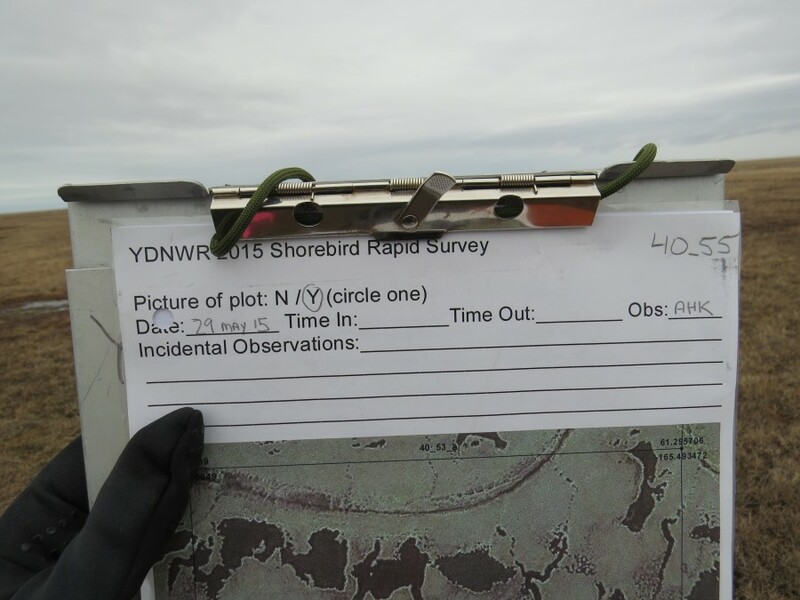 The surveys are done while shorebirds are displaying on nesting territories, which happens somewhat later along the coast, so we were able to do the work after the rivers broke up and allowed boat access. Kristine, Brian, Mark, and I traveled from plot to plot in this USFWS aluminum skiff. We were packed tight! Strong winds shut us down for one day, but other than that weather was manageable. The survey period was split between clear days with soaring temperatures and cooler, drizzly weather. Regardless of the temperature, boat riding is chilly business. 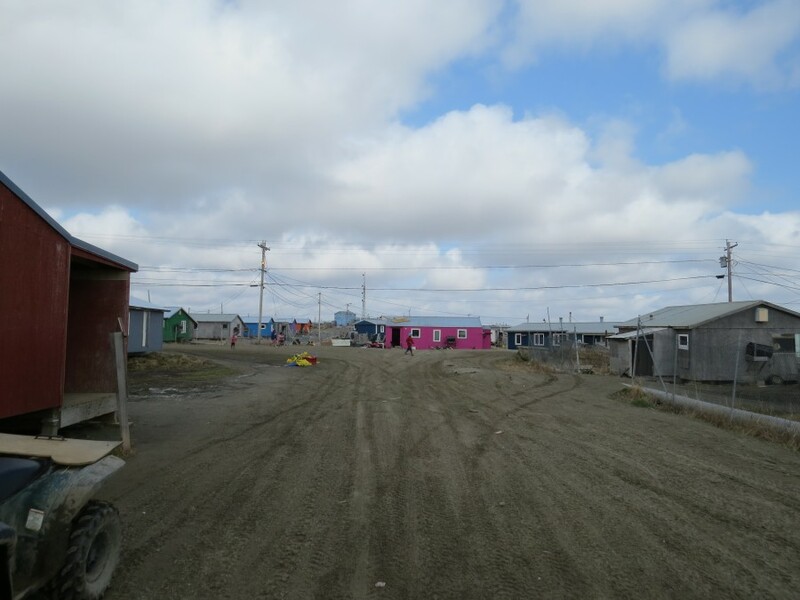 We spent the first day at the refuge headquarters in Bethel where crews for a variety of projects were all scrambling to prepare for imminent deployment into the field. After collecting our nearly 1,000 pounds of gear, we loaded it into totes and hefted it all onto a flatbed refuge vehicle. We then took it over to the RAVN Air hub where we would be flown to Chevak on a Cessna 208 the following morning. One of the main roads of Chevak. The residents were exceptionally friendly. A single box of Cheez-its cost almost $10. Chevak is a town of under one thousand people and showed many characteristics of a frontier town. The roads were dirt, the buildings were minimalistic, and yards were filled with snow machines, ATVs, and the rusted hulls of old equipment. Moose racks adorned the crowns of houses and fish hung to dry in yards. Perched on a dry knoll in a vast wetland matrix, the view from town was vast. Channels big and small snaked away across the tundra, the clouds stretching into the distance. On clear days you can see the peaks of Nelson Island 100 kilometers away. 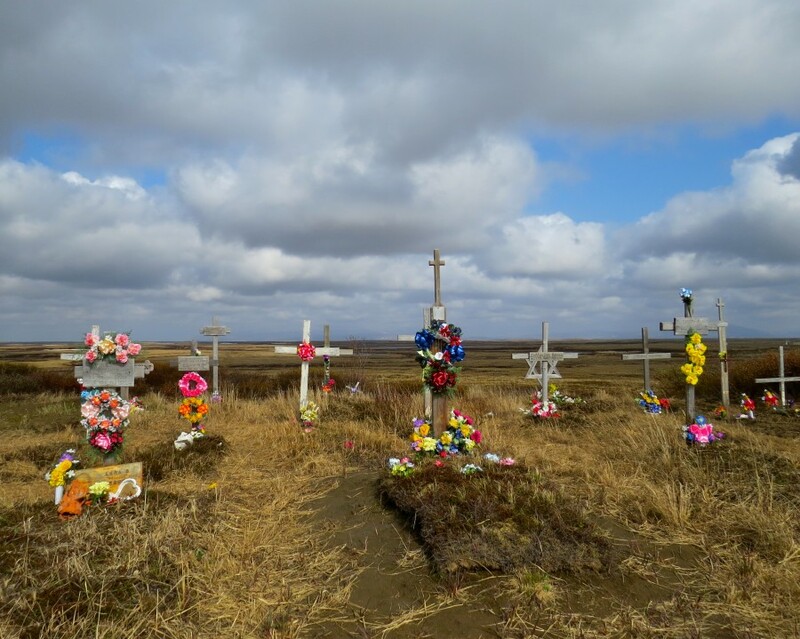 The view from the cemetery in Chevak. 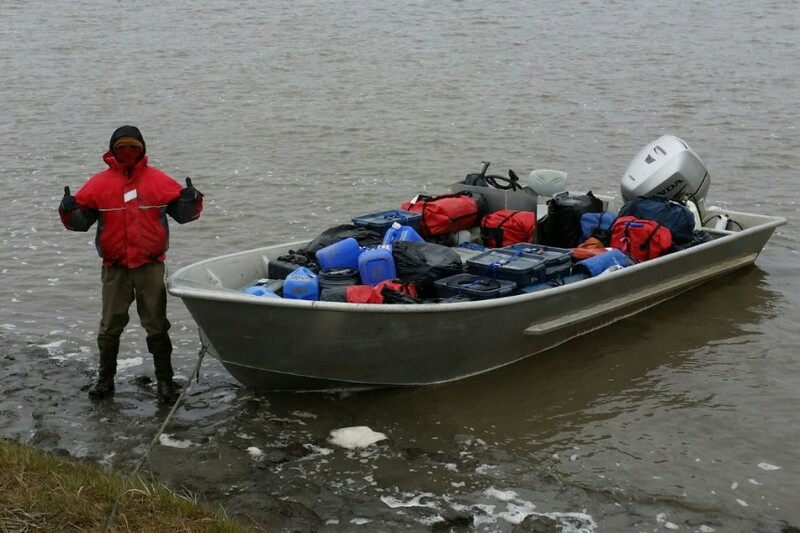 After assimilating our gear we met up with our boat captain Mark Agimuk, a Chevak native. 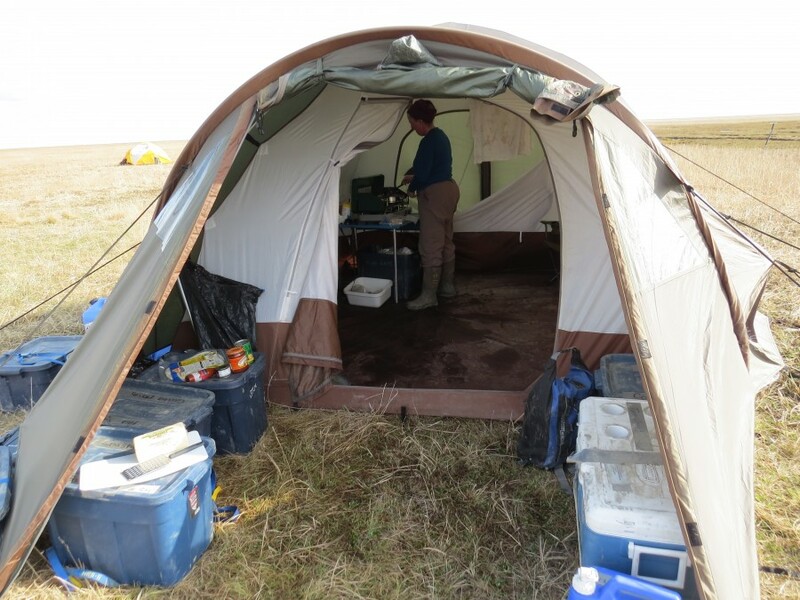 Mark’s lifetime of experience on the Yukon Delta is a critical asset to refuge operation. His life, like many people in the region, depends heavily on the land’s natural resources. It was a pleasure to get to hear his stories about life on the delta and to learn a few works of Cup’ik. The spring salmon run begins in earnest in mid-June, and families all around town were preparing for the move out to their fish camps. 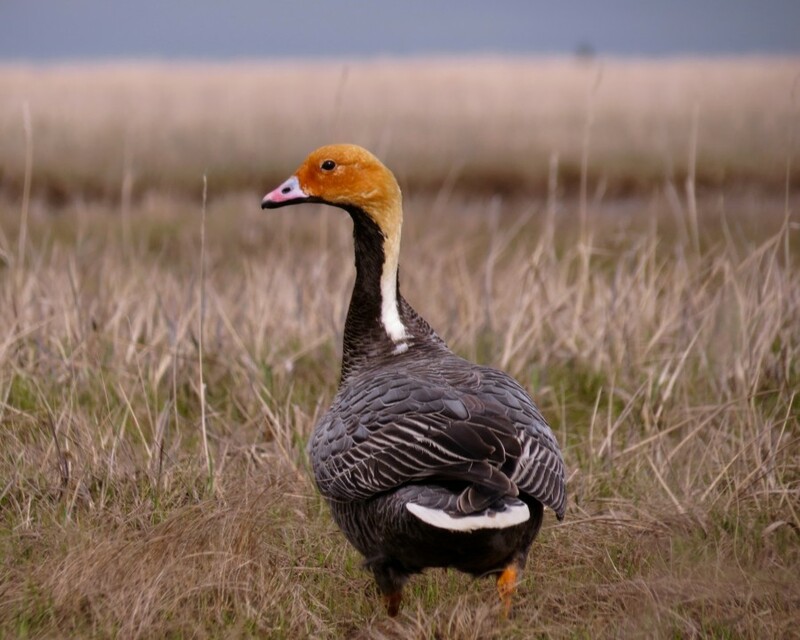 Yukon Delta NWR is nearly the size of Maine and supports significant portions of many range-restricted species, including the Emperor Goose. The rusty hue on the cream-colored neck is caused by naturally occurring iron in the water. I was fortunate enough to come across a tame pair of Red Phalaropes. A staring contest with this male ended in a tie. As Mark steered our boat away from Chevak, we soon become the only people in sight. The wooden frames of fish camps on the banks became sparser as we penetrated deeper into the delta. The first thing I noticed was the incredible number of waterfowl. The sky was filled in all directions by flocks of ducks, geese, and swans. The strident calls of Sandhill Cranes carried over the tundra while Parasitic Jaegers chased Arctic Terns across the bow of the boat. Scanning the horizon, I saw the outlines of stumps from distant forests, carried over the banks of the rivers during flooding storms. 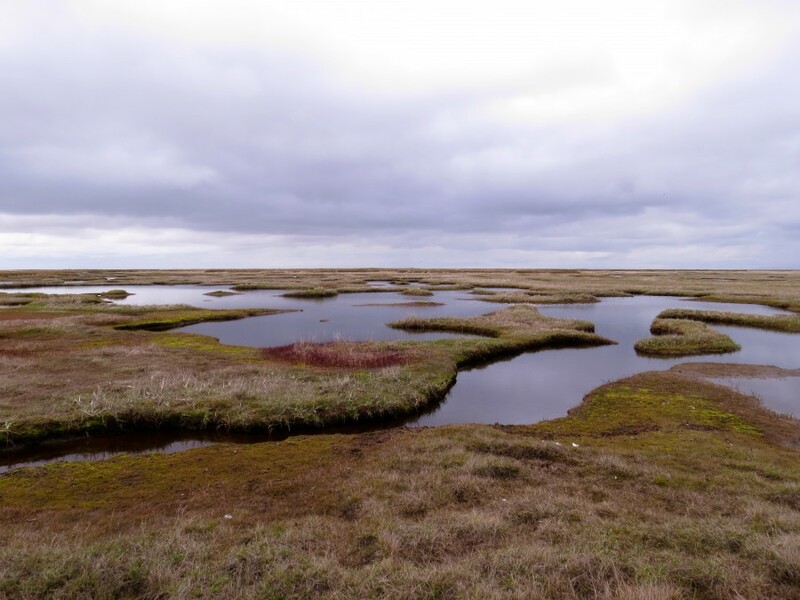 The low tundra closest to the ocean featured many sinuous sloughs and small ponds. The most common shorebirds in this habitat were Dunlin, Red-necked Phalarope, Semipalmated Sandpiper and Black Turnstone. The tundra quickly changed personality on higher ground. 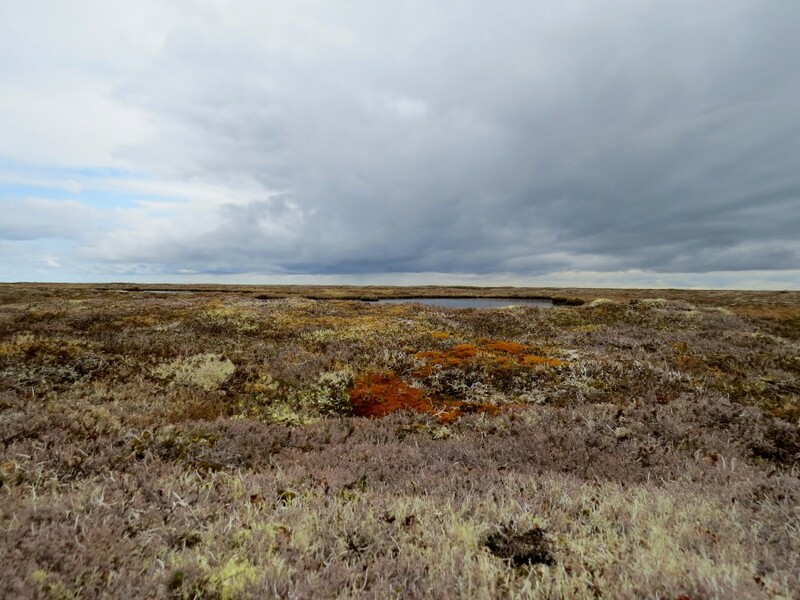 This heath-like tundra had an amazing array of subtle colors, comprised of crunchy lichens, mosses and low-lying plants. This is where we found all of our Black-bellied Plovers, Western Sandpipers, Rock Sandpipers, and Ruddy Turnstones. Kristine whips up some dinner in our communal cook tent. Changing camps five times over the two-week period, it was great opportunity to see a lot of the refuge. Surveying the plots was a challenging, enjoyable task, combining skills of navigation and detailed observation. Assigned a 400-meter x 400-meter plot, the goal of each survey was to cover the plot as thoroughly as possible in 96 minutes. 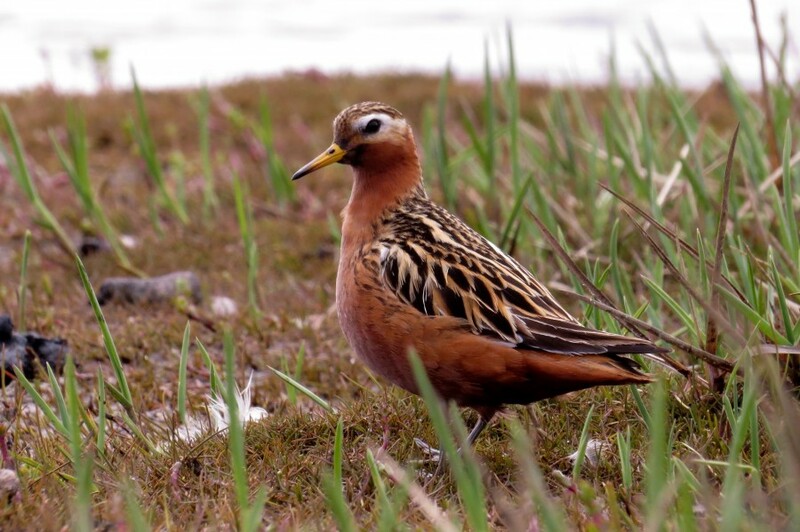 The primary objective of the surveys was to estimate the number of breeding pairs of shorebirds within the plots, whether by direct discovery of nests or behavioral inference. 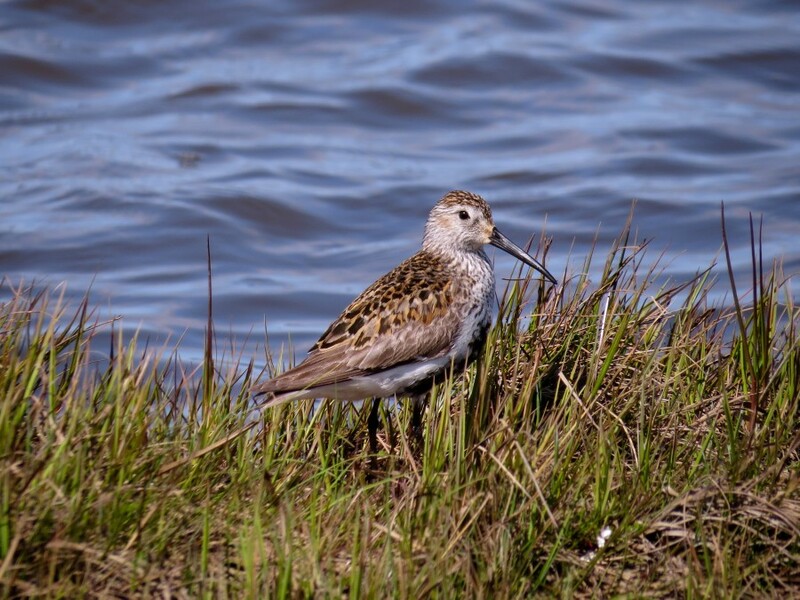 Breeding cues vary among species, whether it’s the incessant song of the Dunlin, the wary eyes of the distant plover, or the aerial assault of godwits and turnstones. 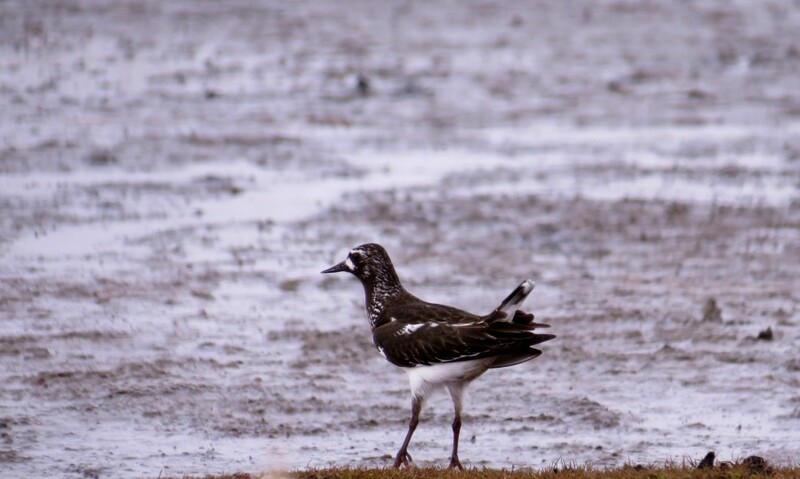 The bulk of the world population of Black Turnstones breed in the Yukon-Kuskokwim Delta. Full of personality, the turnstones lead a highly vocal aerial assault on any predators invading their territory. This is one of the data sheets I recorded on during a survey. Following a satellite image of the 400 m. x 400 m. plot, I recorded exact locations of all shorebirds seen during the survey period. On average each of us covered two plots a day. 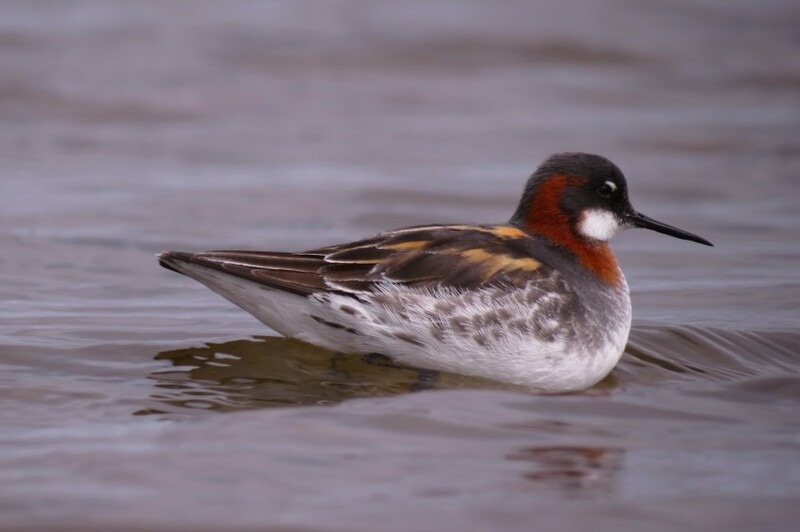 Red-necked Phalaropes were abundant breeders in most wetlands we surveyed. Their polyandrous mating system added a wrinkle to our assessments. Since many of these areas have no biological data, we also made it a priority to record all bird and mammal species seen. In general mammal diversity was low, with a few sightings of Arctic Fox and seals comprising all of our mammal observations for the study period. Dunlin were definitely the most abundant shorebird encountered on our surveys. In the densest locations, I estimated up to 25 pairs in a single a 400 m. x 400 m. plot.